I LOVE The stranger by Chris Van Allsburg. It has been my favorite book as long as I can remember. This book has fantastic illustrations and is about a stranger (Jack Frost). He shows up and has amnesia and when he finally remembers who he is the leaves change color. 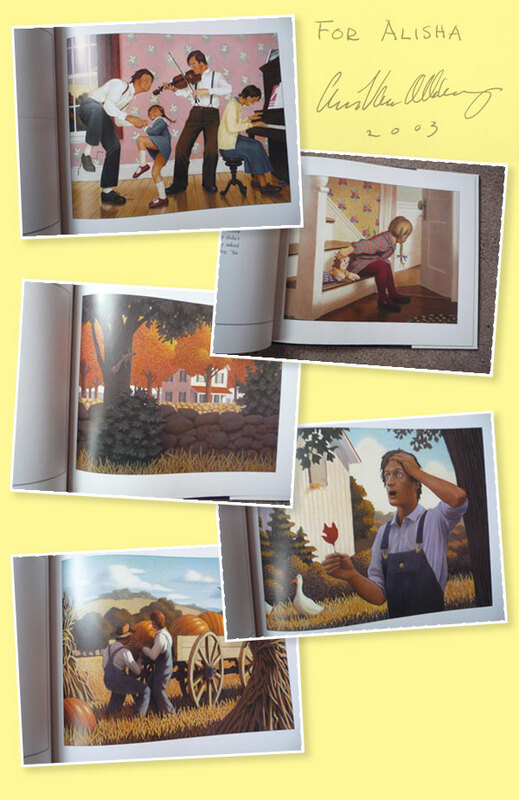 Chris Van Allsburg has been my favorite Illustrator for 23 years. I discovered his books when I was in Kindergarden. I remember every week when we had library I would ask the librarian if she had gotten any new Chris Van Allsburg books. Sometimes she would say "yes," and it would make my day. I've had the pleasure to meet Chris twice. Once was in 2003 at the Curious George shop in Cambridge, MA. The second time was in 2005 in Boston, MA and I actually got to see him give a slide talk about his sculpture work. It is amazing when you get to meet your idol in person. Feel free to leave a comment about your favorite book. I'm always looking for new things to read. I am currently reading Decorate by Holly Becker and Heart of the Matter by Emily Griffin. I remember buying you your first one .